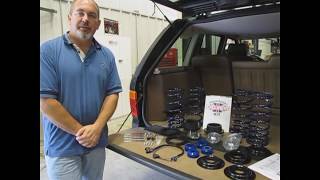 The Best EAS To Coil Suspension Conversion Kits For Land Rovers and Range Rovers Money Can Buy! Is your EAS system starting to fail? Looking for a more reliable, long-term solution for your Rover’s suspension? Look no further than Atlantic British’s coil conversion kits! Atlantic British has pioneered the air-to-coil spring suspension conversion for Range Rover and Land Rover vehicles. Our suspension conversion kits are the best-in-class solution for conversion to coils and offer a compliant, quality ride at an affordable price. VIDEO: Proof from the trail... Watch one of our kits off-road and in action! A Land Rover Electronic Air Suspension has a limited lifespan and replacing EAS components costs a small fortune. Eliminate the costly headaches with our once-and-done coil-over kit solution that provides a quality ride while also eliminating dashboard error and warning lights typically seen when an air suspension is removed. With Atlantic British’s Electronic Air Suspension (EAS) Management Software (included in kit), you’ll keep your Land Rover’s control systems fully enabled. Our All-Inclusive Kits Come With Everything You Need For A Complete Coil-Over!